The recently revealed video (first reported on JJ Keegan’s blog post here) of GolfNow staff celebrating the sale of trade rounds through a rap song, while a bit shocking in its exploitative feel, didn’t tell us anything we didn’t already know. If you’ve spent more than ten solid minutes thinking about their business model, you know that GolfNow is highly motivated to sell the rounds of golf we have given them to sell. And of the millions and millions of rounds we have given them to sell, their primary focus is to sell bartered (trade) rounds. From what I can tell, it represents almost 75% of their income. GolfNow receives all the revenue and they control the price for trade rounds (unless you’re one of the lucky who has successfully negotiated an agreeable floor price). While I have done some entertaining (and sometimes off-color) things to bond with my audiences, I had to shake my head after seeing the parody. Others who reached out to me expressed disgust, shock and “told ya so…” I’ve slept on the matter for a few days, talked to some NGCOA members, my friends at the PGA, some industry consultants I respect, and even spoke with a GolfNow senior executive. I keep coming back to these questions: WHY does the video elicit such a negative response, and WHY are some close to me enjoying the shadenfreude resulting from GolfNow having their kimono opened without their permission? After all, GolfNow’s success comes from selling rounds of golf, and they were simply celebrating their success. Isn’t that good for golf and for the industry? I wish the answer was a simple yes, but it’s not. While GolfNow trumpets their direct working relationship with over 8,000 golf courses, many of those relationships are, well, complicated. Just because a golf course owner is a client, it doesn’t mean they like that fact, or even wish GolfNow existed. Just ask a hotelier if they love their relationship with Expedia, and you’ll get similar answers. I don’t fault GolfNow for pushing hard for aggressive revenue targets and celebrating their success – they have a business to run. Profitable companies, including publicly-traded ones, are part of what make the American economy tick. And profit often drives innovation. Look no further than the pharmaceutical industry to realize that the prospect of enormous financial profits drives the innovation behind medicine. I’m sure somewhere inside the walls of big pharma is the desire to do good for humanity, just like the people at GolfNow would love to help grow the game of golf. While everyone in golf wants to see the game grow (the rising tide lifts all boats thing), make no mistake: it’s ultimately not about growing the game for GolfNow; it’s about being as profitable as possible. GolfNow, the Golf Channel, NBC Universal and Comcast are all driven by financial performance and keeping stockholders and corporate leaders happy. No judgment. Just reality. Among the 50 digital businesses owned by NBC Universal, GolfNow is the most profitable. It’s good to see a golf-related company so successful, when that has not been the lead story in our industry lately. That’s something to be proud of, right? In an industry made up of 15,000 small businesses, most of which struggle with or ignore capturing good customer data, it’s nice knowing there is at least one large entity that has captured robust data on millions of golfers and has modern-day CRM capabilities. What an asset! Can it be used for good? If we can align and equate the success of GolfNow with the success of golf courses, then yes – this can be a good and powerful thing. The ability to leverage GolfNow’s success within NBC Universal is and could be very impactful for our game. The Golf Channel is an amazing asset that we have in golf, and GolfNow’s success supports the success of the Golf Channel. When it comes to the Golf Channel, their success feels like the golf industry’s success. Viewership and ratings are up at the Golf Channel, and I don’t see how that is a bad thing. Also, since NBC is so proud of GolfNow, imagine what they can and may do to promote golf with all of their assets. NBC seems to be getting good at cross-asset and cross-departmental collaboration. How will they support the game of golf? I’m seeing some positive things coming down the pike. The barter method does not require a course owner to strike a check for some pretty robust services. That is a convenience small businesses rarely – if ever – get to enjoy in any industry. Don’t worry. There is a dark side to barter. I know. Just wait. But for this section, I’ll acknowledge there is a seemingly good side to it, most especially for cash-flow challenged businesses. While rare is the person who truly “likes” their competition, the rise of GolfNow is causing others in our industry to sharpen their game. They offer impressive technology and services to golf courses. My hope is that their success also results in better goods and services, and better value, for the people I represent. I’m sure the rise of Starbucks (while some would argue isn’t a good thing), caused many small cafes and other types of businesses to “up” their game. Competition ain’t so bad when it results in good things. The barter method of compensation is often at odds with the fundamental business strategy a golf course has or should have. The fact is, GolfNow uses as many tactics as possible to sell as many Hot Deals (trade rounds) as possible – lowering the price in many cases to almost nothing, pushing gift cards that are only redeemable on Hot Deals, offering double GolfNow Rewards points for Hot Deals, etc. The list of tactics is long and creative. We get it. Every trade round represents a highly-profitable piece of income to GolfNow, and each round has an expiration date; it’s better to get some income than no income, right? We’ve all heard that pricing philosophy in our yield management classes, haven’t we? 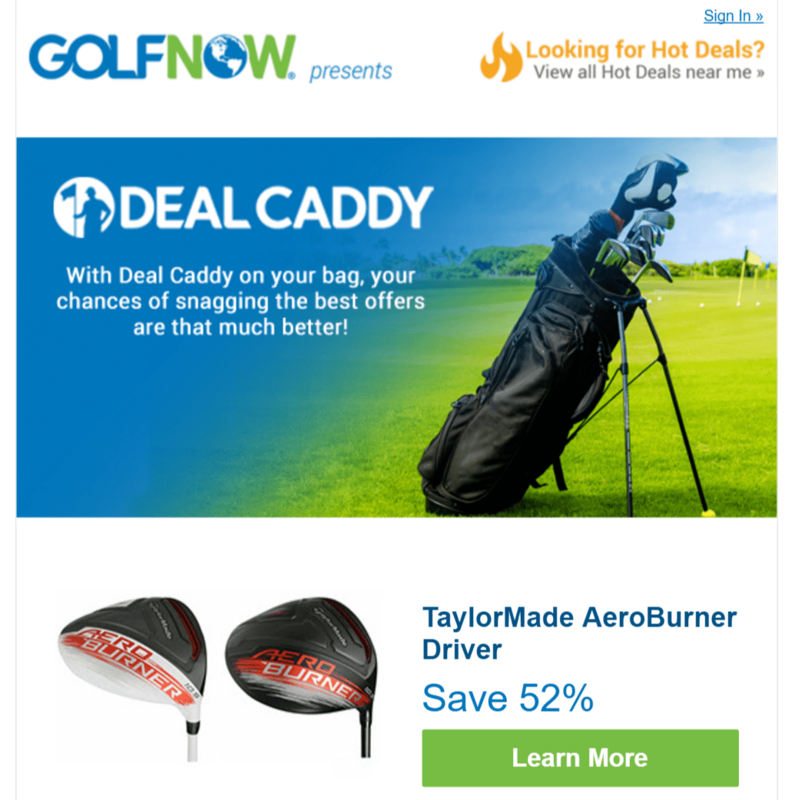 While GolfNow has their own overhead to pay for, it’s easy for them to be relatively cavalier about discounting. GolfNow doesn’t have the overhead, the variable costs, or the brand-positioning responsibilities that are borne by the golf course. Here is an illustration of the serious disconnect between strategists at GolfNow and golf course clients. In the same sales meeting that featured the rap video, GolfNow execs express great pride in how they “blitzed” the Chicago market this past March. March is not typically a good-weather month for golf in Chicago, and some GolfNow folks noticed a spike in search for golf in Chicago. They reacted quickly – let’s make hay while the sun is unexpectedly shining, right? What did the GolfNow team do? They immediately pushed Hot Deals (as low as $18) and pushed them hard. Now, if you’re the golf course operator in Chicago, and you’re seeing a spike in demand for golf…in Chicago…in March…when it’s usually freezing out…would (or should) your first response be to drop your drawers and lower your prices? Hell no! You should be getting a strong price. Chicagoans were probably experiencing cabin fever and happy to get out and play golf at just about any rate you posted. You probably had to bring staff people back early, fire up the grills, turn up the thermostat, get out the apparel, put range balls out, cut the fairways and greens, rake the bunkers, etc. You had variable costs, and your first instinct would not have been to sell $18 rounds of golf. This showed me that GolfNow – instinctively and strategically – is not on the same page as their golf course clients. That is bad. In the full video, GolfNow execs talk about how they have to train their staff to “defend” what they have earned, meaning the trade rounds they sell in exchange for the technology and marketing they deliver. In fact, they have divided their teams into people who “earn” the trade times and those who have to “defend” them. Name any other purveyor or partner with the golf course (think Club Car, Toro, Pepsi, entegra, etc.) who has to train their staff to play defense? It tells me that GolfNow has plenty of course owners and operators who get angry and/or inquisitive about GolfNow’s business practices related to selling Hot Deals. Can you imagine the defensive playbook needed by GolfNow’s field team? Yikes. The fact is that Hot Deals are the center of gravity for GolfNow, but they are simultaneously the kryptonite to course operators. While GolfNow will say they are a small piece of the overall pie of booking in the golf industry, the constant messaging of 80% off to millions of golfers can only result in downward price pressure. And this is a market that is already struggling with keeping the doors open. It feels like GolfNow is picking a fight with the small business owners, who are already a bit bruised and battered by the tough economy and the demographic trends not working in our favor. When it comes to the golfer, both GolfNow and the golf course duke it out for the same customer’s information and loyalty. GolfNow has what they call “GolfNow only rounds,” which I assume means they want golfers to ONLY use GolfNow when they book their golf. Meaning, yes…the partnership with a golf course often means GolfNow is delivering a golfer to the golf course, but don’t think that GolfNow prefers that golfer books directly with the golf course for his or her subsequent rounds of golf. When someone books on GolfNow, GolfNow doesn’t want to share that golfer’s email address with the golf course. Up until recently, they actually refused to share it. Now, from what the managing director of the Golf USA Tee Time Coalition tells me, there is an option for golfers to opt-in to receiving emails from the golf course. 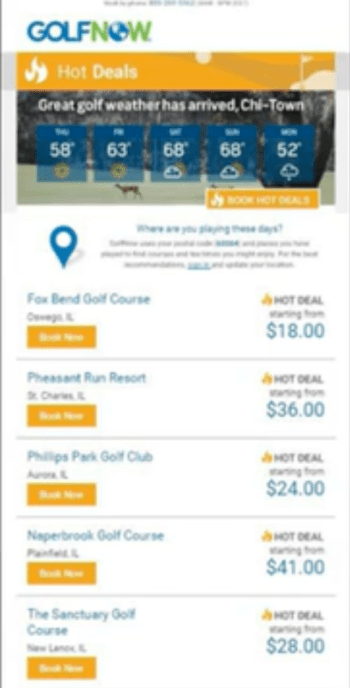 Still, the fact is GolfNow wants golfers booking through them; and golf course owners want the same golfers booking directly through the golf course. When over 70% of GolfNow’s revenue comes from selling Hot Deals, from which none of the revenue goes to the golf course, you bet they are going to fight hard to keep the relationship with the golfer. Feels competitive, doesn’t it? A little too competitive for something that is supposed to be a partnership, don’t you think? This may be a minor thing, but GolfNow sells goods also being sold in pro shops around the country. Like golf courses need yet another online store selling golf equipment. Just adds a bit of insult to injury. 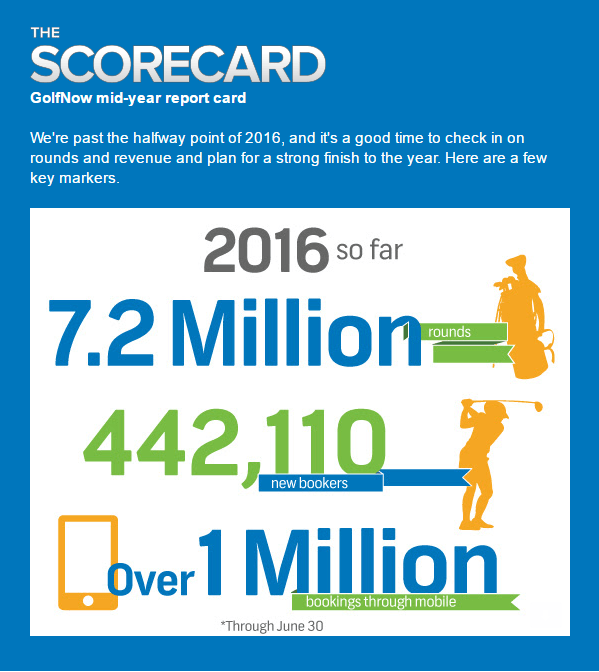 GolfNow likes to celebrate the number of rounds and the number of golfers flowing into their portal, as evidenced by the recent infographic sent to client golf courses. GolfNow is puffing their chest out so much, that they can’t see some golf courses and golf markets possibly getting weaker as GolfNow gets stronger. Their growth and success ultimately mean more and more golfers moving their money, their attention and their loyalty away from the golf course. And yet GolfNow needs to puff their chest and show big numbers and big results, because the larger their numbers are, the more convincing they are to a course that they are needed. I admit that I have no data to quantify my assertion that courses and markets are weaker as a direct result of GolfNow. Due to the fragmentation of our industry, and the historic lack of desire for quality data, I have nothing to go on at the moment except the stories and anecdotes from frustrated course operators. In his book, Blink, Malcolm Gladwell promotes the power of “rapid cognition,” the ability to make judgments and determinations without a lot of data. It doesn’t take long, nor does it take a lot of data, to see and feel the imbalance happening in our industry, and to simply know that it is not good. Started weening ourselves off of GolfNow after their Worry Free proclamation. For those of you nervous to cut ties it has actually worked out very well for us. Who has to ween themselves off something that is healthy and good, except for maybe a breast-feeding baby? You typically need to ween yourself off things not good for you, like smoking or too much craft beer. If there was healthy symbiosis between GolfNow and golf courses, the reaction to the video would not be shock or disgust. GolfNow provides some powerful technology and marketing to golf courses. But if GolfNow’s success meant success for golf courses, wouldn’t we all be rooting for their success? Wouldn’t we have a different reaction to the video? I want our industry to have a different reaction. I want to root for the success of GolfNow? How do we get there? Tee time marketers like GolfNow are not going away. They still have corporate leaders, investors and stockholders to keep happy. That is what keeps them up at night and what gets them up in the morning. With all due respect to those concerns, my concern is the health and well-being of the golf course. And because the number of golfers and golf rounds being played has been steadily shrinking, it all feels like a zero-sum game. A golfer gained by GolfNow currently feels like a golfer lost by the course. And GolfNow says they want to be part of “every round, everywhere” (their “BHAG“). With that kind of ambition, and with the current emphasis of selling trade rounds, how long before their success bleeds the host organisms to death? Hyperbole? Perhaps. But it’s my job to look out for the warning signs and trends in our industry. Is it possible to make GolfNow’s success synonymous with the success of golf courses? If GolfNow doesn’t want to be seen as a necessary evil, but more as a true partner with the golf course, they need to find ways to make the relationships more symbiotic and mutually beneficial, and less parasitic. It’s time to pivot from “how much can we get?” to “how much can we share?” I want to root for the success of GolfNow! 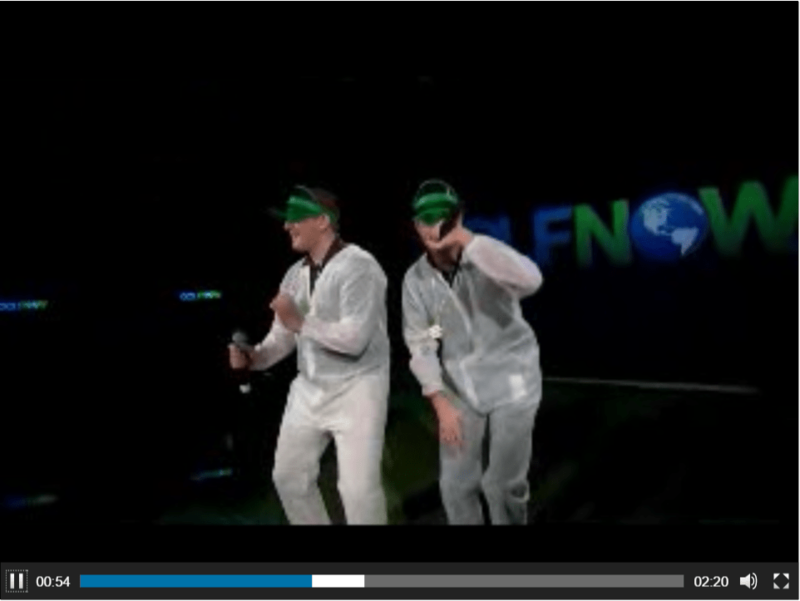 I want to get up on stage and rap with those two jokers, in the name of selling more golf rounds. But only if, with each round sold on GolfNow, the course is realizing a net-positive benefit. We have literally given to GolfNow the power and authority they have. With great power comes great responsibility. My message to the leaders of GolfNow (or any other tee time marketer, really) is – use your power to make golf courses healthier, not weaker. And until you can prove your presence is adding to the bottom line of a course, we won’t believe you. Showing a course the revenue and rounds results you are having with them just means you’re getting more powerful – not necessarily more helpful. Stop leading with the “80% off” message. While everyone loves a deal, most golfers are not looking for the cheapest possible round. Yet, your marketing assumes this to be true. And we know why. You have Hot Deals to sell. But how much money are we all leaving on the table by practically giving it away? I recall a conversation I had with Scott Merchant, founder of GolfPipeline (which neither barters nor focuses on discounts), last fall. 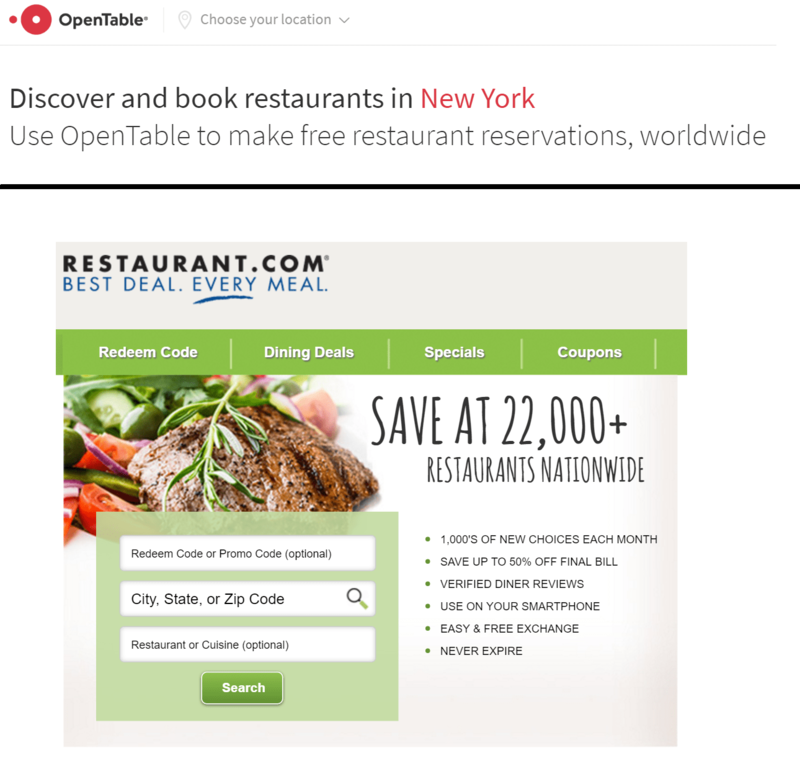 He astutely said to me, “Jay, think about the difference between OpenTable.com and Restaurant.com. Only one of them leads with the discount message. The other simply touts the virtues of eating out and helps you find a great place to eat. The golf industry doesn’t need a Restaurant.com.” A great analogy, in my opinion. We are not going to discount our way to success in the golf industry. And yet if barter continues to be the chosen method of compensation to GolfNow, golf courses should have the ability to negotiate reasonable floor pricing on every trade round. Or find ways to split the revenue with golf courses on Hot Deals. Owners and operators might not feel so bitter. Be more proactive about offering cash or commission models. And when it is cash or commission, don’t overestimate your value in the marketplace and charge arms and legs for your booking services. As we see from those who sign up and subsequently leave GolfNow, courses can indeed thrive without you. I don’t think adding value through ancillary services for the golf courses is the complete answer to being a better partner. Long-term change in how you are able to harvest and sell our inventory is the answer. And be transparent about YOUR results with a golf course’s inventory. Share with the course what you sold and for how much you sold it. I understand you don’t actively share pricing and revenue related to course’s own Hot Deals. If a course was to know how much in Hot Deals you sold, would they feel good about the value in the barter? If you’re not sharing it, the assumption is you have a reason to hide it. In the business-to-consumer golf ecosystem, we have three primary organisms: 1) customers, 2) golf courses and 3) marketers (it’s why they are called “third” parties). In our ecosystem, the tee time marketer is the one organism that has been growing and growing and growing – maybe the only one, if you stop to think about it. We cannot control what kinds of organisms make their way into the golf ecosystem. But we can remind course owners and operators about the nature of the relationships between organisms. We can remind courses who actually owns the inventory of tee times. Who has the ability to say yes or no. Who can stay or walk away. I’ll give you a hint – it’s not the marketers. The role of NGCOA and the new Golf USA Tee Time Coalition with the PGA of America is to bring light to the dark areas of the ecosystem, and to influence things in ways that allow for symbiosis. Parasite-and-host relationships can actually be a healthy thing, when each party remembers their role and actually benefits each other. But don’t leave it up to the parasite to tell you if the relationship is beneficial. Only the host knows if he or she is better off. We will work hard to see that golf courses’ interests are protected and advanced in this ecosystem. We are the most important organism that allows the game to be played and allows marketers to exist. A member of NGCOA I admire told me of the relationship between the oxpecker and the rhinoceros. 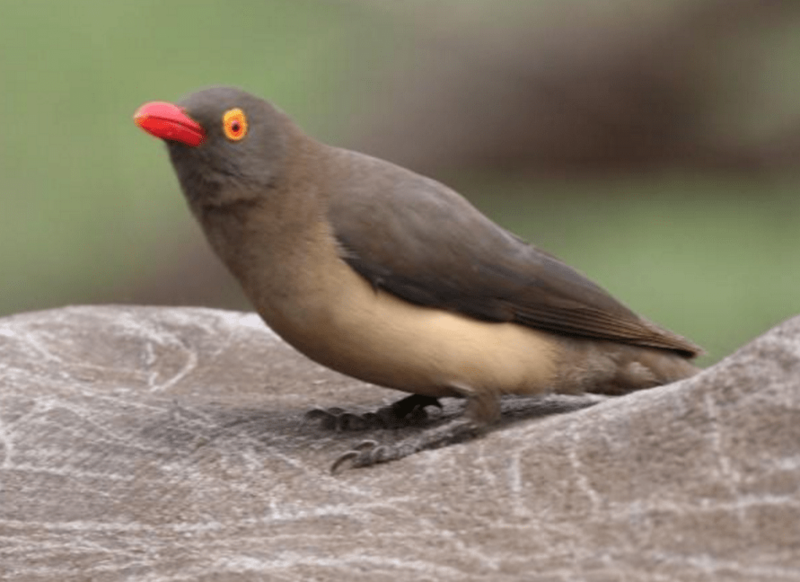 The oxpecker bird lands on the rhino and gets its daily sustenance by eating ticks and other parasites off the rhino. The rhino gets natural pest control. When danger is coming at the rhino, the oxpecker can scream a warning to its host. They are making use of each other in beneficial ways. In what ways do you think the relationship between tee time marketers and their host organisms can be healthier and more productive? Is this really a zero-sum game? Can we support the success and profitability of tee time marketers and simultaneously experience gain at the golf course? How will we know when a marketer is getting their fair share, rather than more than their fair share? I harbor no malice for GolfNow. I like the people at the Golf Channel and GolfNow. I’ve played friendly rounds of golf with them, I serve on industry leadership committees with them and philosophized about the future of our industry with them. I want them to be successful. But only if their success yields a net positive result for every course with which they do business. Imagine ten years from now we get a glimpse of GolfNow sales people (or TeeOff.com, or Golf18Network.com, or SupremeGolf.com, or GolfPipeline.com etc.) celebrating wild success. What needs to happen to make us feel GOOD about that? What conditions must exist? I invite you to share your comments below. Thanks to JJ Keegan for bringing this forward. The only people who can mitigate the damage of this harmful parasite are course owners. be educated and only work with partners who also have our interests at heart. Get ahead of the learning curve and deliver to customers the experiences they want. This is no easy task in an industry that is maturing and changing. We are rooting for the likes of Golf Pipeline, those who truly want to grow the game, and are in it for the long haul not just this quarters earnings. New options are available to golf owners that allows them control of their tee-time online bookings using a comprehensive course management system far more robust than GolfNow or any of the current vendors on the market today. I would suggest golf course owners look closely at Golfsmash.com. They are a new player and the only course management system that has signed and follows the NGCOA best practice guidelines. They offer everything from course scheduling, POS, Food and Beverage, email marketing, social networking with the golfing community, mobile app, and more… There is no longer term contract and the first 40 courses that have joined were free (no cost to use). they are changing their pricing model to charge a nominal fee but potentially tens of thousands below what others are paying via the barter system. The courses that have converted love the product. I suggest every golf course owner thats tired of the barter system to give Golfsmash a call or more information. You may find it to be a good fit for your club. Was at 2017 PGA Show and saw a new company called Find a Game. Seemed to be course friendly and did a deal with ezlinks. Working to eliminate threesomes. Anyone know of them? Thank you, Jay. Illuminating article and interesting to better understand how the relationship works between golf now and the course. I have been a customer of their services over the past several years. They have achieved no loyalty from me and their customer service reflects the type attitude you have expressed in their treatment of course operators. I suspect it is a company that will in time self destruct, though it sometimes seems to take too long for karma to catch up with greed. this was an extremely good post. Get your Office Setup Installed with the help of this link http://www.office.com/setup. To install the Microsoft Office visit office.com/setup. Find how to download, install, activate all versions of Microsoft Office setup and activate on http://www.office.com/setup. norton.com/setup – for norton setup, go to http://www.norton.com/setup and sign in or login to your record, setup, download, reinstall and regulate norton features. office.com/setup microsoft is a staggering association in the present world, in view of its extensive variety of IT courses of action. microsoft engages people to direct associations over the globe, create game plans, and get revelations. norton.com/setup – for norton setup, go to norton.com/setup and sign in or login to your record, setup, download, reinstall and regulate norton features. Norton is one of the trendiest antiviruses everywhere throughout the world. Furthermore, it is notable for ensuring the gadget and furthermore giving a one-stop security answer for every one of the clients worldwide with just one click. mcafee.com/activate – Find easy steps for downloading, installing and activating McAfee, Enter your 25-digit activation code at mcafee.com/activate. norton.com/setup – Buy the Norton product and then login to Norton account for downloading the setup. After installing it, navigate to norton.com/setup for activating it using the product key. Office.com/setup – Read on to know how to purchase, download, reinstall, install, uninstall and activate Microsoft Office setup for Office 365, Office 2016, Office 2013, Office 2010, Office 2007, and Office 2003. Go to office.com/setup to activate the Office product. Visit office.com/setup to activate Office setup by entering 25 digits Product Key. Purchase Office 365 or 2016 from Office.com/setup and follow a step-by-step guide to download, install and activate Office suite on your PC. Visit mcafee.com/activate to step by step download and install McAfee products. Purchase and activate your McAfee antivirus for Mac, Windows, iOS and Android from mcafee.com/activate. Norton is one among the foremost standard antivirus that is extremely acknowledged for shielding device and giving a 1 stop security answer to any or all the individuals worldwide. The company offers an excellent vary of package answer that defend your desktops, laptops and mobile phones from the unwanted harmful on-line threats. Installing Webroot from wwwwebrootcomsafe.com is easy. When you are buying webroot antivirus software for your business or setting home for the personal use. The Application suite has the something for all users either it is personal use, small business use or big business use. Norton antivirus protects your PC/Laptop by scanning it perpetually. It instantly blocks something making an attempt to enter your PC/Laptop and asks you for permission to permit it to enter. If it’s a virus or a worm or something that may probably cause harm, it isolates it instantly and so alerts you. Norton Antivirus additionally protects you from being infected after you use a moment messaging program. Malicious programs can typically try and enter your pc this way. TomTom GPS’s Road Trips feature allows you to customize your driving experience. Enjoy a fully customized trip and discover incredible roads. Combine business with pleasure by planning your trips according to different criteria. Worried about PC security? Get McAfee antivirus (free or paid) and find the process to download. Bolster your device and data security by heading to mcafee.com/activate. Thanks For Sharing Information, I really Like Your Blog. Its Really Helpful For me And Please Keep Posting.. I Read Your Blog Post and I found it nice and I like Format. Please Keep Posting I will Wait For Next One.. I Always Like your Blog and Find it Interesting please keep posting .. This is really nice Blog and its really helpful.. It is a great article and such a piece of great information shared with us. I really loved it. A big thank you for your blog article. Thanks Again. Want more. Find all the required steps for downloading, installation and activation of Microsoft Office setup. Sign in to http://www.office.com/setup to start the installation process. Thank you for sharing this post with the general public. Norton antivirus is especially used for the information technology security. Setting up Office is rather easy, one needs to download the setup from office.com/setup and then install it.